Want to make Twitter account private? then here’s an article to read. In here, I have listed out some easy steps that you can use to make Twitter account private. Making your account private on Twitter like is an easy process that can be done by anyone. Have you ever tried to access someone’s twitter page only to see that the account is private or that you can’t follow the person because the person has his or her account set to private? Now to today’s business. by default, your Twitter account is set to public. You can make your account it private so that only users who are approved can subscribe to and view tweets by you. People not following will need to make a request to follow you, and you will have to approve the requests. Tweets by you will only be visible to users you have approved. Your tweets won’t appear in Google search. They will only appear in Twitter searches conducted by your approved followers. @replies you send will not be seen publicly unless you send them to approved followers. For example, if you tweet a celebrity they will not be able to see it, as you have not approved them to follow you. Whatever you tweeted while your account was set to public will automatically become private, and will only be viewable by your approved followers. 1. Log in to your Twitter account with your username and password. 2. Click on your Twitter Account profile Icon. 3. Click on the “Settings and Privacy“. 4. Click on “Privacy and safety“. 5. Scroll down, check the “Protect my Tweets“. 6. Scroll down to the bottom of the settings page, and click on “Save changes“. 7. Unprotect your tweets. 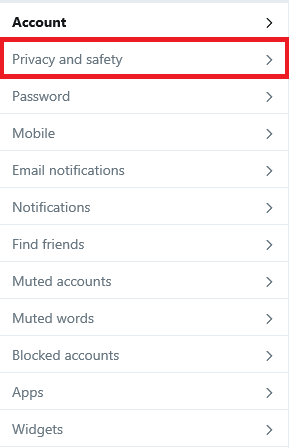 If you want to reverse the process and make your tweets public again, just uncheck the “Protect my Tweets” box. Log into your Twitter account. Click on “Settings and privacy”. Scroll down to “Settings.” Click on the “Privacy and safety” tab. Scroll down to the bottom of the page. Hit “Save changes”. A: Nope, Your current followers won’t need to follow you again. Q: How can I tell if my personal information is public? A: Log out of Twitter, then search for your name and Twitter on Google. The results you see will be what the general public will see when they search for your information. Q: How can I send a private Tweet?